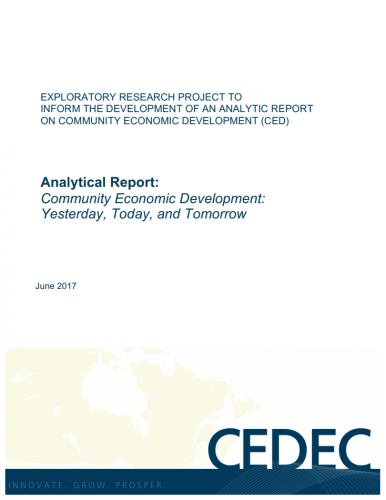 This report provides an overview of the concept of Community Economic Development (CED). Specifically, it is one of three main outputs from a project that examines CED and assesses the extent to which the concept informs and supports CEDEC’s strategic and day-to-day thinking and action. In its entirety, the project provides CEDEC with observations and recommendations intended to enhance its understanding of CED and how it might be used to enhance CEDEC’s organizational performance. The primary objective of this Analytical Report is to determine the historical and current theory and practice of CED, and hypothesize what CED could be in the future, both conceptually and with regards to its practical application. (b) How might CED continue to inform and support CEDEC’s future performance? (3) the results of a CED April 2017 workshop in which participants discussed the future of CED concepts and practices. The Analytical Report finds that CED is an increasingly relevant, yet challenged concept in a dynamic and changing socio-economic and political environment. This context provides numerous opportunities to grow the CED movement, clarify and enrich its theoretical basis, and enhance its practice. Some of the more prominent opportunities include situating itself within, and responding to, the creation of new economies, changes to the labour market, changes in the traditional engines of economic growth, and addressing the increasing importance and relevance of issues such as climate change and persistent inequality. To take advantage of these opportunities, however, several challenges need to be addressed, including ironing out definitional issues, addressing fragmentation in the CED movement and its practice, resituating and framing CED in light of the changing socio-economic and political environment, addressing an ageing membership, and overcoming a history of poor measurement of CED and its impact. The report concludes with a series of eleven recommendations that are informed from the findings of this project. The intent of these recommendations is to inform an ongoing reflection about CED modernization and evolution. More specifically, the purpose of the recommendations is to contribute to CEDEC’s consideration of how CED theory and practice might continue to support the organization’s ongoing positioning and performance.